In April of 1939 the New York World's Fair, "Building The World of Tomorrow," opened on what was once a marshy wasteland in Flushing Meadows, just east of the great metropolis. From its inception to its closing ceremonies, the Fair promoted one of the last great metanarratives of the Machine Age: the unqualified belief in science and technology as a means to economic prosperity and personal freedom. Wedged between the greatest economic disaster in America and the growing international tension that would result in World War II, The World of Tomorrow was a much-needed antidote to the depression and confusion of the times. It provided the one saving grace which all of America needed - it provided hope. Of course that hope was not to come without some cost, and counted among the limitations of The World of Tomorrow were its emphasis on product consumption and a hegemonic notion of the ideal American citizen. The Fair's established theme was one of international cooperation, but its true emphasis was on the "new-ness" of ideas, forms, and especially consumer products. Like all things new, it was immensely exciting and at times naive. However, in the words of Nathaniel Hawthorne, the "moonlight of romance" which surrounded the Fair inevitably gave way, and in two summers it ran its course, closing in 1940. Nevertheless, its cultural legacy has lasted well into the late twentieth century and has helped shape and define the commercial, cultural, and political climate of post-World War II America and the world. In a sense, we have lived through The World of Tomorrow, and the Fair has kept many of its promises, for better or for worse. Part ideological construct, part trade show, part League of Nations, part amusement park, and part Utopian community, the Fair promoted its message of hope and prosperity with icons, symbols, exhibitions, and demonstrations. It was a literal laboratory for a group of industrial designers who considered themselves both artists and social theorists, and from the plan of the Fair's site to many of its prominent buildings, the Fair's primary stylistic vocabulary was that of the streamlined and Modern design which they helped establish. Nowhere was that design more apparent than in the Trylon and Perisphere, a 700-foot spire and an orb as wide as a city block, created to be the exposition's focal point. The Trylon and Perisphere remain forever linked with The World of Tomorrow; both loom as profound and problematic icons on the landscape of American culture. This site examines the social, cultural, and commercial impact of the Fair on the American way of life in the twentieth century. It attempts to provide some texture and even a little color to what is all too frequently viewed as the black-and-white sensibility of "the past." The World of Tomorrow may be seen as a stopping point on the continuum of American spectacles which began with the 1893 Chicago World's Columbian Exposition and thrives today in the Disneyworld complex of Orlando, Florida. This site, however, treats the Fair as a somewhat encapsulated volume of cultural information, with the Columbian Exposition and the Depression as one bookend and World War II and Disneyworld as the other bookend. It remains an entity unto itself, and its impact on twentieth century America cannot be overestimated. The Fair was the Modern advancement of American enlightenment ideals: a democratized promised land, intended to uplift all citizens and serve as a shining example for the rest of the world, promoting the notion that economic prosperity results for all who believe. The World of Tomorrow was a search for a useable Future (with a capital "F"), and while it added fuel to the fire of the American cultures of consumption and exclusion, it also provided a tangible vision of hope and prosperity in the face of uncertainty and confusion. 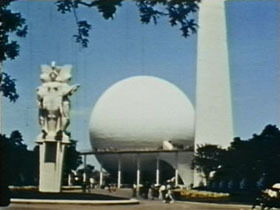 Welcome to the 1939 New York World's Fair. Welcome to Tomorrow.